The National Cancer institute and the National Institute of Health both recommend eating 5 fresh fruits and vegetables every day. A great way to help reach that goal is to include sprouts. Sprouts are the only form of agriculture that can be locally grown and available in all four seasons. These “baby” vegetables are grown from seed to salad in only week. That makes them great Y2K food. In fact, one pound of alfalfa seed will yield 10-14 pounds of fresh mini-salad greens. Whether you are on top of a mountain or in a bunker with artificial light, you can still grow this fast, organic food. Yes, it is fast food, but you won’t be sacrificing any nutrition. Alfalfa sprouts have more chlorophyll than spinach, kale, cabbage or parsley. Alfalfa, sunflower, clover and radish sprouts are all 4% Protein. Compare that to spinach – 3%, Romaine lettuce – 1.5% and Iceberg lettuce – 0.8%, and milk – 3.3%. These foods all have about 90% water. But meat and eggs are the protein foods for Americans. Meat is 19% and eggs are 12.5% protein (and 11% fat). But Soybean sprouts have 13% protein, and lentil and pea sprouts have 9%. Soybeans sprouts have more protein than eggs and only about half the fat. Grain and nut sprouts, such as wheat and sunflower, are rich in fats. While fats in flour and wheat germ have a reputation for going rancid quickly (stores should refrigerate them), fats in sprouts last for weeks. The valuable wheat germ oil in wheat sprouts is broken down into its essential fatty acid fractions over 50% of which is the valuable Omega 6. While sunflower oil is our finest source of omega 6, germination of the sunflower sprout micellizes the fatty acids into an easily digestible, water soluble form saving our body the trouble of breaking it down and simultaneously protecting us against the perils of rancidity. This is a great bonus for a sprout that is already popular for its crispness and nutty flavor. Radish sprouts have 29 times more Vitamin C than milk (29mg vs 1mg) and 4 times the Vitamin A (391 IU vs 126). These spicy sprouts have 10 times more calcium than a potato (51mg vs 5mg) and contain more vitamin C than pineapple. If you examine what is happening during germination, it looks like a vitamin factory. While the mature organic radish vegetable from your backyard contains 8 IU/100g of provitamin A, the 5 day old radish seedling (sprouts) contain 391 IU. That’s 39 times more vitamin A! No wonder, sprout lovers say you can feel the vitamins! Alfalfa, radish, broccoli, clover and soybean contain concentrated amounts of phytochemicals (plant compounds) that can protect us against disease. Canavanine, an amino acid analog present in alfalfa, demonstrates resistence to pancreatic, colon and leukemia cancers. Plant estrogens in these sprouts function similarly to human estrogen but without the side effects. They increase bone formation and density and prevent bone breakdown (osteoporosis). They are helpful in controlling hot flashes, menopause, PMS and fibrocystic breasts tumors. Johns Hopkins University School of Medicine researchers found substantial amounts of glucosinolates and isothiocyanates in broccoli sprouts which are very potent inducers of phase 2 enzymes that protect cells from going malignant. The sprouts contain 10-100 times higher levels of these enzymes than do the corresponding mature plants. Alfalfa sprouts are one of our finest food sources of saponins. Saponins lower the bad cholesterol and fat but not the good HDL fats. Animal studies prove their benefit in arteriosclerosis and cardiovascular disease. Saponins also stimulate the immune system by increasing the activity of natural killer cells such as T- lymphocytes and interferon. The saponin content of alfalfa sprouts multiplies 450% over that of the unsprouted seed. 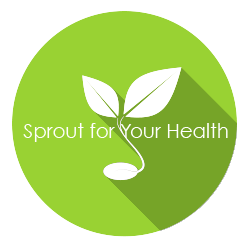 Sprouts also contain an abundance of highly active antioxidants that prevent DNA destruction and protect us from the ongoing effects of aging. It wouldn’t be inconceivable to find a fountain of youth here, after all, sprouts represent the miracle of birth.